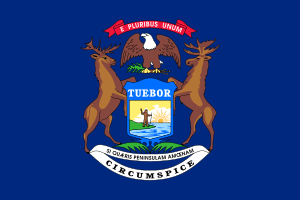 Dickinson County is a county in the Upper peninsula of the U.S. state of Michigan. As of the 2010 census, the population was 26,168. The county seat is Iron Mountain. 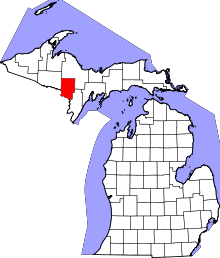 Dickinson is Michigan's newest county, formed in 1891 from parts of Marquette, Menominee, and Iron counties. It was named for Donald M. Dickinson, who served as U.S. Postmaster General under President Grover Cleveland. Dickinson County is part of the Iron Mountain, MI–WI Micropolitan Statistical Area. According to the U.S. Census Bureau, the county has a total area of 777 square miles (2,010 km2), of which 761 square miles (1,970 km2) is land and 16 square miles (41 km2) (2.0%) is water. The 2010 United States Census indicates Dickinson County had a population of 26,168. This is a decrease of 1,304 people from the 2000 United States Census. This is a -4.7% change in population. In 2010 there were 11,359 households and 7,320 families in the county. The population density was 34.4 per square mile (13.3 square kilometers). There were 13,990 housing units at an average density of 18.4 per square mile (7.1 square kilometers). 97.2% of the population were White, 0.6% Native American, 0.5% Asian, 0.3% Black or African American, 0.2% of some other race and 1.2% of two or more races. 1.0% were Hispanic or Latino (of any race). 17.4% were of German, 13.1% Italian, 11.2% French, French Canadian or Cajun, 11.1% Swedish, 7.4% Polish, 6.9% Irish, 6.9% English and 5.5% Finnish ancestry. There were 11,359 households out of which 26.5% had children under the age of 18 living with them, 51.0% were husband and wife families, 9.0% had a female householder with no husband present, 35.6% were non-families, and 30.6% were made up of individuals. The average household size was 2.26 and the average family size was 2.80. In the county the population was spread out with 21.4% under age of 18, 6.7% from 18 to 24, 21.3% from 25 to 44, 31.6% from 45 to 64, and 19.0% who were 65 years of age or older. The median age was 45 years. 49.2% of the population was male, and 50.8% was female. The 2010 American Community Survey 3-year estimate indicates the median income for a household in the county was $42,331 and the median income for a family was $52,222. Males had a median income of $31,402 versus $14,957 for females. The per capita income for the county was $22,583. About 3.4% of families and 10.9% of the population were below the poverty line, including 11.4% of those under the age 18 and 11.3% of those age 65 or over. 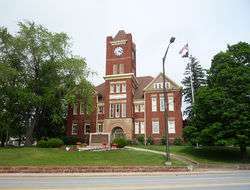 The county government operates the jail, maintains rural roads, operates the major local courts, keeps files of deeds and mortgages, maintains vital records, administers public health regulations, and participates with the state in the provision of welfare and other social services. The county board of commissioners controls the budget but has only limited authority to make laws or ordinances. In Michigan, most local government functions — police and fire, building and zoning, tax assessment, street maintenance, etc. — are the responsibility of individual cities and townships. In the 2006 elections, it was also the most supportive county of proposal 2, a state constitutional amendment banning affirmative action programs. It received 74.2% support in the county. 1 2 "Bibliography on Dickinson County". Clarke Historical Library, Central Michigan University. Retrieved July 6, 2013. 1 2 3 "County History/Development". Dickinson County, Michigan. Retrieved February 25, 2013. 1 2 "State & County QuickFacts". United States Census Bureau. Retrieved August 27, 2013. ↑ "2010 Census Gazetteer Files". United States Census Bureau. August 22, 2012. Retrieved September 21, 2014. ↑ "U.S. Decennial Census". United States Census Bureau. Retrieved September 21, 2014. ↑ "Historical Census Browser". University of Virginia Library. Retrieved September 21, 2014. ↑ "Population of Counties by Decennial Census: 1900 to 1990". United States Census Bureau. Retrieved September 21, 2014. ↑ "Census 2000 PHC-T-4. Ranking Tables for Counties: 1990 and 2000" (PDF). United States Census Bureau. Retrieved September 21, 2014. 1 2 "American Factfinder". United States Census Bureau. Retrieved July 6, 2013. ↑ Data Access and Dissemination Systems (DADS). "American FactFinder". census.gov. ↑ "Dickinson County Elected Officials". Retrieved July 6, 2013. ↑ "Antoine". Geographic Names Information System. United States Geological Survey. 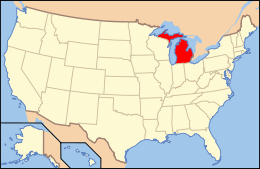 Wikimedia Commons has media related to Dickinson County, Michigan. "Bibliography on Dickinson County". Clarke Historical Library, Central Michigan University. Retrieved July 6, 2013.